The model is known to run in PCEnv, OpenCell and COR and the results replicate the published paper (Figure 5), as generated by the original model. The units have been checked and are consistent. ABSTRACT: Multisubunit cytokine receptors such as the heterotrimeric receptor for interleukin-2 (IL-2) are ubiquitous in hematopoeitic cell types of importance in biotechnology and are crucial regulators of cell proliferation and differentiation behavior. Dynamics of cytokine/receptor endocytic trafficking can significantly impact cell responses through effects of receptor down-regulation and ligand depletion, and in turn are governed by ligand/receptor binding properties. We describe here a computational model for trafficking dynamics of the IL-2 receptor (IL-2R) system, which is able to predict T cell proliferation responses to IL-2. This model comprises kinetic equations describing binding, internalization, and postendocytic sorting of IL-2 and IL-2R, including an experimentally derived dependence of cell proliferation rate on these properties. Computational results from this model predict that IL-2 depletion can be reduced by decreasing its binding affinity for the IL-2R betagamma subunit relative to the alpha subunit at endosomal pH, as a result of enhanced ligand sorting to recycling vis-a-vis degradation, and that an IL-2 analogue with such altered binding properties should exhibit increased potency for stimulating the T cell proliferation response. These results are in agreement with our recent experimental findings for the IL-2 analogue termed 2D1 [Fallon, E. M. et al. J. Biol. Chem. 2000, 275, 6790-6797]. Thus, this type of model may enable prediction of beneficial cytokine/receptor binding properties to aid development of molecular design criteria for improvements in applications such as in vivo cytokine therapies and in vitro hematopoietic cell bioreactors. 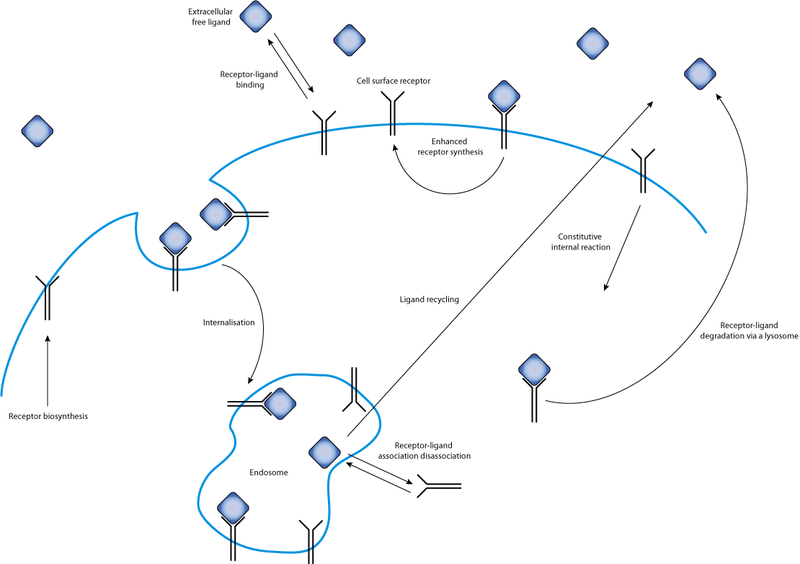 A schematic diagram of Fallon and Lauffenburger's 2000 computational model of IL-2-receptor binding and trafficking. The model follows the path of an extracellular ligand as it is bound to a cell surface receptor, internalised, degraded or recycled. Derived from workspace Fallon, Lauffenburger, 2000 at changeset ea0210d2ea87.